Whatever one’s stance on Science and religion may be or if one has faith or not, one has to recognize that a turning point in the History of Science has been passed. 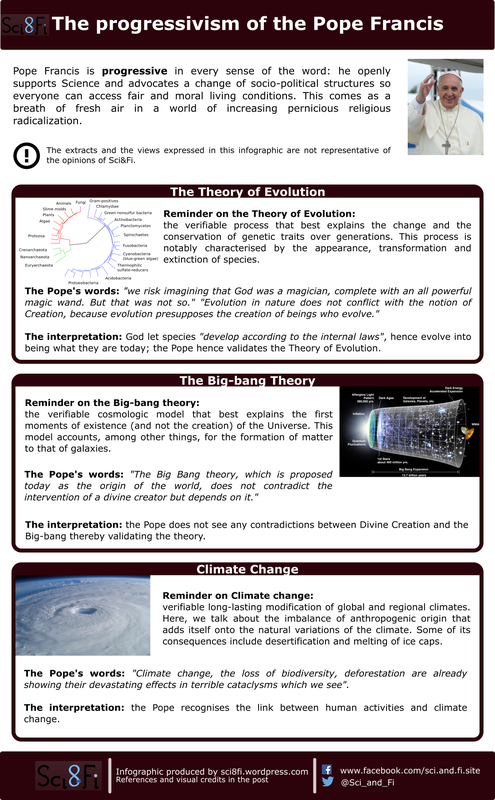 Three of the most fundamental scientific concepts have been officially recognised by the Pope, namely the Evolution, the Big-bang and Climate change. 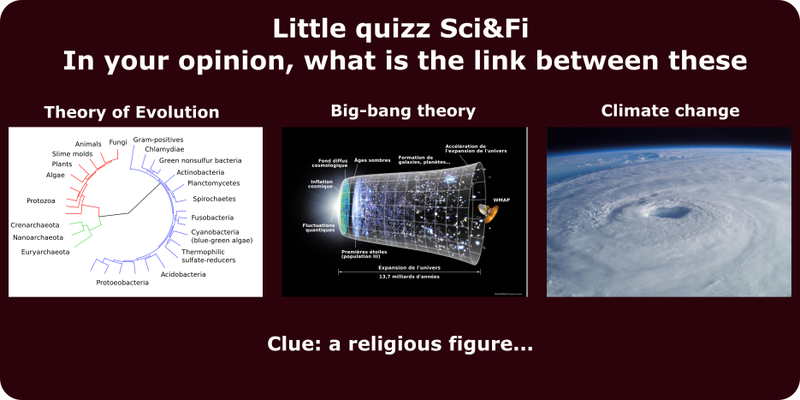 Could the Pope be more scientific than some of His believers ? Why is that of any interest some would ask. Well, let’s be honest religion and science have not always gone hand in hand. Let’s look at today’s world where there is a big trend towards “Intelligent” Design in the United States and the Islamic State (ISIS) has been destroying archeological jewels (artifacts and entire sites!) and even in the past where the Catholic Church was fervently anti-science (should we even mention the Inquisition and Galileo??). Thus, we can only rejoice about the Pope’s position on science. In this world of rampant and foul obscurantism, Sci&Fi just wanted to highlight the Pope’s progressivism. Let’s hope that all the other moral and religious authorities will follow and openly promote Sciences and the scientific process. Sci&Fi needs you to grow. Like us on our Facebook page, share this post with your friends, we’d really appreciate it. Thank you so much for reading! Jeon Han, Korean Culture and Information Service, Pope Francis South Korea 2014. NASA, Hurricane Isabel from ISS . Pope Francis and vision on Science: Michael Specter (2014) Pope Francis and the G.O.P.’s Bad Science, The New-Yorker. On the theory of Evolution and the Big-bang: Address of His Holiness Pope Francis on the occasion of the inauguration of the bust in honour of Pope Benedict XVI. 27th October 2014. On climate change: Address of Pope Francis to the participants in the World meeting of popular movements. 28th October 2014. This entry was posted in Philo and society and tagged Big-bang, climate change, Evolution, Pope, Progress, Religion, Science. Bookmark the permalink.